n 1980, the Englishman Tim Berners-Lee, an independent contractor at the European Organization for Nuclear Research (CERN), Switzerland, built ENQUIRE, as a personal database of people and software models, but also as a way to play with hypertext; each new page of information in ENQUIRE had to be linked to an existing page. In 1984 Berners-Lee returned to CERN, and considered its problems of information presentation: physicists from around the world needed to share data, and with no common machines and no common presentation software. He wrote a proposal in March 1989 for "a large hypertext database with typed links", but it generated little interest. His boss, Mike Sendall, encouraged Berners-Lee to begin implementing his system on a newly acquired NeXT workstation. He considered several names, including Information Mesh, The Information Mine (turned down as it abbreviates to TIM, the WWW's creator's name) or Mine of Information (turned down because it abbreviates to MOI which is "Me" in French), but settled on World Wide Web. Robert Cailliau, Jean-François Abramatic and Tim Berners-Lee at the 10th anniversary of the WWW Consortium. He found an enthusiastic collaborator in Robert Cailliau, who rewrote the proposal (published on November 12, 1990) and sought resources within CERN. Berners-Lee and Cailliau pitched their ideas to the European Conference on Hypertext Technology in September 1990, but found no vendors who could appreciate their vision of marrying hypertext with the Internet. By Christmas 1990, Berners-Lee had built all the tools necessary for a working Web: the HyperText Transfer Protocol (HTTP) 0.9, the HyperText Markup Language (HTML), the first Web browser (named WorldWideWeb, which was also a Web editor), the first HTTP server software (later known as CERN httpd), the first web server (http://info.cern.ch), and the first Web pages that described the project itself. The browser could access Usenet newsgroups and FTP files as well. However, it could run only on the NeXT; Nicola Pellow therefore created a simple text browser that could run on almost any computer. To encourage use within CERN, they put the CERN telephone directory on the web — previously users had had to log onto the mainframe in order to look up phone numbers. Paul Kunz from the Stanford Linear Accelerator Center visited CERN in September 1991, and was captivated by the Web. He brought the NeXT software back to SLAC, where librarian Louise Addis adapted it for the VM/CMS operating system on the IBM mainframe as a way to display SLAC’s catalog of online documents; this was the first web server outside of Europe and the first in North America. On August 6, 1991, Berners-Lee posted a short summary of the World Wide Web project on the alt.hypertext newsgroup. This date also marked the debut of the Web as a publicly available service on the Internet. An early CERN-related contribution to the Web was the parody band Les Horribles Cernettes, whose promotional image is believed to be among the Web's first five pictures. In keeping with its birth at CERN, early adopters of the World Wide Web were primarily university-based scientific departments or physics laboratories such as Fermilab and SLAC. Early websites intermingled links for both the HTTP web protocol and the then-popular Gopher protocol, which provided access to content through hypertext menus presented as a file system rather than through HTML files. Early Web users would navigate either by bookmarking popular directory pages, such as Berners-Lee's first site at http://info.cern.ch/, or by consulting updated lists such as the NCSA "What's New" page. Some sites were also indexed by WAIS, enabling users to submit full-text searches similar to the capability later provided by search engines. There was still no graphical browser available for computers besides the NeXT. This gap was filled in April 1992 with the release of Erwise, an application developed at Helsinki University of Technology, and in May by ViolaWWW, created by Pei-Yuan Wei, which included advanced features such as embedded graphics, scripting, and animation. Both programs ran on the X Window System for Unix. Students at the University of Kansas adapted an existing text-only hypertext browser, Lynx, to access the web. Lynx was available on Unix and DOS, and some web designers, unimpressed with glossy graphical websites, held that a website not accessible through Lynx wasn’t worth visiting. The turning point for the World Wide Web was the introduction of the Mosaic web browser in 1993, a graphical browser developed by a team at the National Center for Supercomputing Applications (NCSA) at the University of Illinois at Urbana-Champaign (UIUC), led by Marc Andreessen. Funding for Mosaic came from the High-Performance Computing and Communications Initiative, a funding program initiated by then-Senator Al Gore's High Performance Computing and Communication Act of 1991 also known as the Gore Bill. The origins of Mosaic had begun in 1992. In November 1992, the NCSA at the University of Illinois (UIUC) established a website. In December 1992, Andreessen and Eric Bina, students attending UIUC and working at the NCSA, began work on Mosaic. They released an X Window browser in February 1993. It gained popularity due to its strong support of integrated multimedia, and the authors’ rapid response to user bug reports and recommendations for new features. The first Microsoft Windows browser was Cello, written by Thomas R. Bruce for the Legal Information Institute at Cornell Law School to provide legal information, since more lawyers had more access to Windows than to Unix. Cello was released in June 1993. After graduation from UIUC, Andreessen and James H. Clark, former CEO of Silicon Graphics, met and formed Mosaic Communications Corporation to develop the Mosaic browser commercially. The company changed its name to Netscape in April 1994, and the browser was developed further as Netscape Navigator. 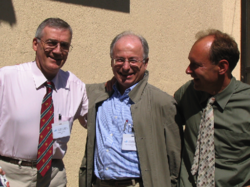 In May 1994 the first International WWW Conference, organized by Robert Cailliau, was held at CERN; the conference has been held every year since. In April 1993 CERN had agreed that anyone could use the Web protocol and code royalty-free; this was in part a reaction to the perturbation caused by the University of Minnesota announcing that it would begin charging license fees for its implementation of the Gopher protocol. In September 1994, Berners-Lee founded the World Wide Web Consortium (W3C) at the Massachusetts Institute of Technology with support from the Defense Advanced Research Projects Agency (DARPA) and the European Commission. It comprised various companies that were willing to create standards and recommendations to improve the quality of the Web. Berners-Lee made the Web available freely, with no patent and no royalties due. The World Wide Web Consortium decided that their standards must be based on royalty-free technology, so they can be easily adopted by anyone.